It was Friday, April 23, 1982. I was fourteen, one month shy of my fifteenth birthday. I remember the day and the events that sealed my fate very clearly (although admittedly I had to dig up the old journal I’d kept then to look up the exact date). Whether it was an epiphany, or a choice, or simply one turn of events that set others into motion, what happened that day would mark me as a composer for life. I would not fully acknowledge that fact, undeniably embrace my fate so to speak, for another three years. But it is clear that from April 23, 1982 on, whether I wished to or not, I was a composer. Up until then if you asked me “what I would be when I grow up” I would have said “actor” (and maybe occasionally added “director”). From as long as I could remember I loved performing and would do so unselfconsciously at any occasion that presented itself or just freely about the house (to my brother’s annoyance). It is probably in my genes. My mother is an opera singer and her mother was a singer and actress during her youth in Finland in the 1920’s. My mother has told me that the way I express myself on stage reminds her forcefully of old stage photos of my Finnish grandmother. So I was likely created a performer, Born That Way to misquote Lady Gaga (although I guess I am also Born That Way in the other sense). Except for one strange inexplicable lapse in Kindergarten when I told my teacher I wanted to be a doctor (still can’t fathom why after all these years) I always knew I wanted to be an actor. Being a composer was not a particular ambition. I loved all the arts. As a kid I would engage in all varieties of creative pursuits, and although I did compose a couple of tunes for a make-believe musical version of Robin Hood when I was eleven, I spent many more childhood playtime hours building hand puppets and marionettes or drawing cartoons or writing short stories. If I had any serious artistic ambitions outside of performing it was for writing children’s stories, some of which I unsuccessfully tried to get published. The children’s book publisher who rejected my children’s book “Das Goldene Ei” – The Golden Egg – (with illustrations by my Mom) asserted in her rejection letter that books had to be at least a hundred pages long to be published (a ridiculous assertion, considering there is a whole class of children’s picture books that are much shorter). After I received that rejection I took it upon myself to write a children’s book of at least one hundred pages. This book, “Es war einmal ein Frosch”, begun when I was eleven, would turn me into a composer three years later. When I was in 9th grade, my music teacher Steven Hepner ran a composing lunch club. I was a kid who just in general loved to be creative no matter the medium, and I had had nine years of piano lessons, so I composed something for the piano. Over many months I would bring Mr. Hepner a piano piece to which I added a couple measures every week. Eventually I found a way to give the piece an ending. But then I needed to bring in something else to the lunch club. Mr. Hepner found the nature of the lyrics rather curious. What is this about a comet and coming down from the Milky Way? I explained that I had been writing a children’s book in German called “Es war einmal ein Frosch”, which was a riff on the Frog Prince fairy tale, but in my story Prince Charming is really an extra-terrestrial who is accidentally transformed into a frog when he is beamed down onto the planet. He manages to make contact with Princess Marianne, who is desperate not to be forced into a marriage with the neighboring kingdom’s Prince Waldemar, a union negotiated as part of a peace treaty. She ends up kissing one frog after another to find and elope with the extra-terrestrial whom she sees as her Prince Charming. This tune would be his love song to her. His space man persona explains the nature of the lyrics. I thought it was a crazy suggestion. It was one thing to write one little song – not even a full song with verses and chorus, just a short tune with a simple set of lyrics – it was a whole other thing to write a musical. I couldn’t do that! The next day was a Saturday, and by the end of it I had two more songs written, one for the hapless “other” Prince Waldemar and one called “Fairy Tales”. I knew I was on a path of no return. I was going to write this musical. By Sunday I was working on yet another song. But my father had a point, and I secretly knew it. 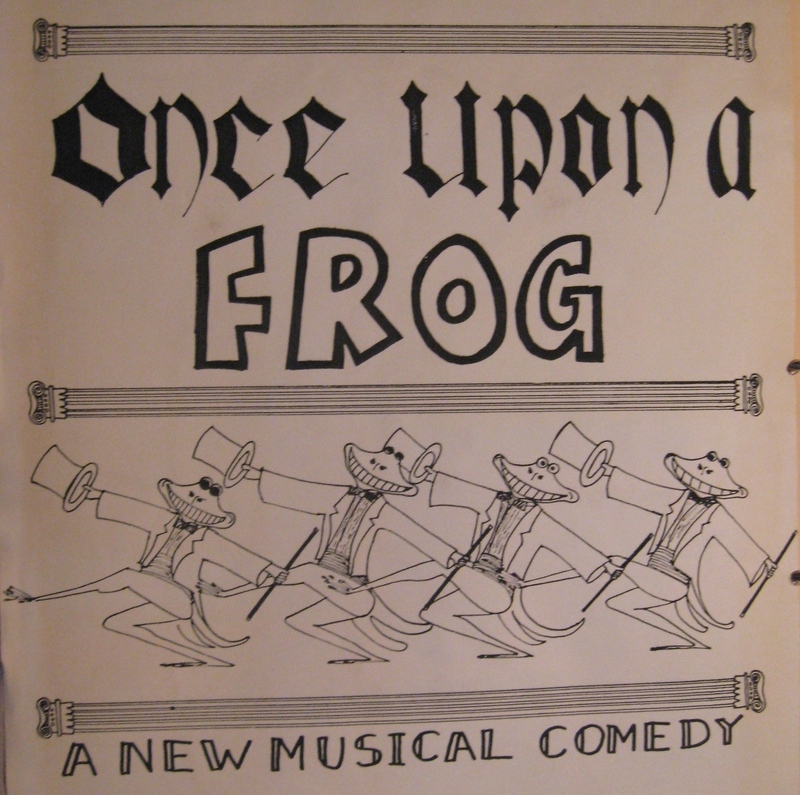 From the beginning of working on “Once Upon a Frog” it was my ambition that the songs would at least be good enough to compare well enough with your average Broadway and Hollywood musical (with which I had a wealth of experience from obsessively watching them on TV to participating in the school musical productions). I also already exhibited a strong taste for certain kinds of musical flourishes, like that minor note at the end of the first phase in “Love Theme (The Comet)”. My father loved singing that phrase about the house but he would always end on the major note rather than the minor note, and I would end up correcting him. Mr. Hepner found that note strange too and urged me to change it to the major option. He also suggested I iron out the odd dissonant phrase on “here to stay”. But I stubbornly insisted it was those very notes which made “The Comet” good and interesting. It wouldn’t be the first time I would staunchly defend one of my “unexpected” note choices from efforts to smooth them out. Once I was working on “Once Upon a Frog” in earnest I developed a strong point of view about what I was doing. Still, that didn’t mean I thought of myself as a “real composer” rather than as a kid who likes to compose, just like I didn’t think of myself as a “real writer” (and I still don’t) but as a kid who likes to write (and I still do, well, maybe not a “kid” anymore). However, three years and one and a half months later “Once Upon a Frog” was being performed at my high school. I have a very distinct memory of looking up from the piano at the action on stage, and recognizing that the work is good but also that I was already capable of much better. There was a feeling, a certainty deep in my mind or soul or DNA that I wasn’t just someone who composed, but that composing was an integral part of who I am, as deeply ingrained as any other indelible trait, perhaps even more so. I didn’t choose to be a composer. Composing announced itself to me rather unexpectedly and forcefully. Eventually I accepted I have no choice in the matter. I am a composer. Excerpt from what would become the third verse of “Love Theme – The Comet” as performed 1985 in “Once Upon a Frog”. This entry was posted in Beginnings, Musicabilia and tagged Abraham Ashkenasi, anecdote, Born That Way, composer, composing, father, Frog Prince, high school, high school musical, John F. Kennedy School, Lady Gaga, music, music teacher, musical. Bookmark the permalink.